Murano is a small island just north of Venice, and it has been the undisputed capital of Venetian glass for ages. Glass production in Murano started in 1291 when the Venetian Republic forced all of the glassmakers to move their entire workshops and factories out of the city to this now-famous Island. Murano jewelry and glasswork has been renowned around the world for centuries for the styles, quality of work and of course all the gorgeous colors. 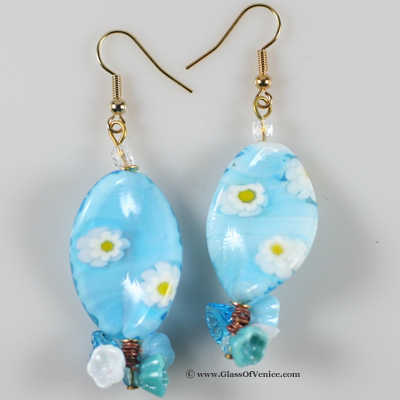 Murano glass jewelry is created from the mix of silica and chemical compounds that slow the solidification process. As this mixture is heated to very high temperatures, it liquefies, allowing the master to work the glass by giving it the desired shape and pattern. Then it cools down, resulting in creation of the colored glass canes, which are then used to make jewelry. Adding colors and creating patterns are the hardest parts in making the jewelry because the chemical compounds involved in making the glass colored are extremely sensitive. For Murano jewelry to come out beautiful, it takes a master craftsman in order to get the colors correct and the patterns beautiful. For example, in order to create the amazing color of aquamarine, you need to add in a fusion of cobalt and copper. This takes someone who knows exactly how to mix the chemicals for them to retain their properties in the heat of the glass-making process, and how much of each chemical to add into the glass. Once these colorful glass canes are created, they may be used for all sorts of Murano jewelry, beadwork, art glass and chandeliers. Glass beadwork and jewelry is very fashionable right now. Not only is Murano jewelry beautiful and unique, but it is also of the highest quality available. In the world of glass collectors, designers, and admirers, Murano Island holds a special and symbolic place. Glassmakers are still working there producing some of the greatest glass beads, jewelry, artwork, and more. While the island of Murano is not so easy to get to, the World Wide Web has made Murano jewelry more accessible. Searching the Internet is a fantastic option for those who want to find these amazing glasswork pieces, as there are websites offering various pieces of Murano jewelry for sale. However, one needs to be careful when buying Murano glass jewelry, because in recent years there have been many fake pieces and counterfeits offered for sale as “Murano Glass”. Every Murano glass buyer needs to know that Murano glass can only be produced on Murano Island within Venice, Italy. All other places of origin produce counterfeits. When you purchase authentic Murano jewelry, you know that you are not only getting a piece of jewelry, you are actually getting a piece of history and art. This special art of glassmaking has been around for centuries, and to this day, Murano glassmakers are among the city’s most prominent citizens. In the past, many of the glassmakers that migrated to Murano Island held a lot of commercial and economical power due to the precious knowledge they possessed. Today, these skilled artisans and talented designers are held in high respect for their work. Murano jewelry is very popular among both collectors and the general public, and has been exported all over the world for years. Whether you are looking for an unusual pendant, beautiful earrings, a ring that truly stands out, or any other stylish piece of jewelry, by buying Murano glass you create a unique and beautiful look that will impress everyone around you. Thank you, Julia, for sharing all this interesting info on Murano Glass! The next time I see a piece of it, it will be much more meaningful to me now that I’ve learned something about it. I appreciate your posting this info here. History + Art = Way Cool! The reason all glass makers were moved to the island of Murano from Venice was the very nature of their glass making work – fire! The government officials felt the danger of a fire disaster in Venice was too great so moved this industry to a separate island. Just makes the story of “Murano Glass” even more fascinating I think. I’ve been to the island of Murano twice and it’s one of the most beautiful places I’ve ever seen. Every time I look at my chandalier I bought there, it brings so many memories. The second time I went, I toured bead factories and I was hooked.It was so very fastenating and incredible to see these artists at work. Thanks for this great article. It made me want to go back! The real reason for Venetian rulers’ decision to move glassmakers out to Murano island remains disputed even to this day. While it is often written in the popular press and on the Internet that the reason was the danger of fires from the furnaces to the largely wooden structures of overpopulated Venice, many historians believe that this was just the official reason given by the government. The real reason, they think, was the strategic importance of the glassmaking craft to the Venetian Republic and the need to safeguard its secrets. Having rediscovered many ancient Roman techniques and having learned from the Byzantine Empire and trade with the Orient, by the 1200’s Venetian glassblowers became the best in production of the finest glass pieces. An small island not too close yet not too far from Venice, Murano was a perfect location for isolating the glass artisans. It ensured that they wouldn’t be able to disclose trade secrets, yet allowed to efficiently move their completed products to Venice for sale and delivery to customers. To support this theory, it is important to note that by the late 1200s, the production of glass objects of the finest quality was the city’s major industry as confirmed by the establishment of the Glassmakers Guild that laid out rules and regulations for the craftsmen. The purpose of the guild was to safeguard the secrets of the trade and ensure the profitability of the industry. In line with these objectives, a 1271 law prohibited the importation of foreign glass or the employment of foreign glassworkers. So it was only logical that an even more radical law was passed in 1291 that required all furnaces used for glassmaking to be moved from Venice. A subsequent law passed in 1295 forbidding the glassmakers from leaving the city further confirms this theory. Thank you for starting this post. I had an opportunity to go to Murano once and I met a wonderful lady in a small shop where her son-in law still keeps tradition of making millifiory beads. I saw how it was done. I had read some where that the Chevron beads started in Venice, probably in Murano, that they were used to be traded for or buying slaves in the 1200century time period. I don’t know if I am confusing something or if it were true. But certainly I can understand why they kept the secrets in Murano. It is fascinating to learn the history that you have shared. Thank you again. What an interesting post, several years ago I made Venetian trade beads the central focus in all pieces for an annual gallery exhibition. When I was designing and assembling that body of work and held each bead in my hand, I could not help asking…where have you been? what were you traded for? where will you be in another hundred years? Consequently I have been in love with Murano glass ever since, and their beautiful beads feature extensively in my work. But back to the title of this post! I read recently that the demise and economics of Murano glass furnaces is at breaking point. Many of the furnaces are old and new pollution laws require the furnaces to rebuild in order to comply. But in the current economy they simply cannot see the viability of spending the millions it will take. I understand that some very creative ideas have been circulating. One is to create a consortium furnace on land in Marghera (just before the bridge to Venice) and run it 24/7 with workers from Murano, thereby eliminating the individual overheads of each furnace. Time will tell if the Muranese are far too secretive and competitive to work together in this manner and in fact some furnace owners have already come out against this proposal. Some say if it is produced in Marghera it could not then be called ‘Murano Glass’. But after all, as has already been pointed out, the furnaces moved from Venice to Murano some 700+ years ago and yet it is still called ‘Venetian Glass’. Let’s hope they can resolve the problems confronting them and that they remain the heart of a centuries old glass industry. I now view every bead that I receive as something very special, particularly as the industry is also confronted with young people not wanting to follow in family footsteps to keep the centuries old traditions alive.